In a special presentation which is based on his new book, The Bellwether Effect, Dr. Secretan explores how and why leaders are attracted to, and seduced by, trendy ideas and the process by which these ideas then become mainstream. He shares eight examples of counterproductive business practices and proposes inspiring alternatives that are proven to lead to transformation and an inspiring culture. This is likely to be one of the most profound and uplifting speeches on leadership you will ever get to experience. Inspire! : Leadership at it’s Best! The need to inspire has never been greater than it is today, as many people feel exploited, cynical, and under-appreciated. In fact, most companies try to motivate their people with traditional leadership models. Secretan’s keynote, Inspire!, offers an alternative way to inspire from within and become a leader that inspires others. It starts with the individual and spreads to transform organizations. Inspire! teaches business leaders how to ignite superior performance by speaking to the deeper needs of business relationships, and by aligning their desires with your organization’s cause. The keynote provides valuable guidance and shares a host of stories that illustrate how inspiring leaders have transformed their business environment from places of fear and resignation to powerhouses of effective performance. · Mastery: Undertaking whatever you do to the highest standards of which you are capable. · Chemistry: Relating so well with others that they actively seek to associate themselves with you. · Delivery: Identifying the needs of others and meeting them with respect and a passion. · Learning: Seeking and practicing knowledge and wisdom. · Empathizing: Considering the thoughts, feelings, and perspectives of others. · Listening: Hearing and understanding the communications of others. Powered by these Values and their Accelerators, Lance shows how our organizations then seek new Direction through Shifts from old values to new ones. For leaders, it is remarkable how much more effective and rewarding their roles become. Thousands of organizations have embraced Lance’s Value-Centered Leadership worldwide. Society for Healthcare Strategy & Market Dvlp. How much I enjoyed your presentation – it was the hit of our conference. On a scale of zero to ten, you were an eleven. Captivating only touches the surface of the impact Lance Secretan had at our recent C-Suite Conference. The top business leaders from some of the largest companies are rarely inspired as they were by Lance. Bringing his creditability as a corporate CEO coupled with his wisdom and humility, Lance offered a new perspective to what matters for long-term business success. Lance grabbed everyone’s attention in a surprising way. He talked about love, a topic that is always present in our lives and mostly ignored in a business setting. He showed the link of our core capacity for caring for the concerns of others that is the foundation for inspiration. He challenged the value of vision and missions statements and showed the power of an organizational dream to change the destiny of organizations and all who work there. We have had many leading speakers at our events. Lance is at the top of the list for us. I just wanted to thank you again for a truly inspiring keynote address to our boards of trustees and leaders. Your message carried over the next two days and will certainly be a foundation for discussion at future board and leadership team meetings. I hope our paths cross again soon. Lance Secretan has learned something that escapes most executives: that their employees have souls. Even better, Lance shows would-be leaders how to create organizations with soul and the results to prove it. During the transition to my current leadership position, Lance Secretan offered a sounding board, solid advice and deep experience that was extraordinarily valuable. As a result of many years as an operating CEO, he is wise and deeply grounded in the experience of being a CEO. He does not hold back his truth and represents a wonderful, highly intelligent partner for sharing ideas and candor. My path towards my present position was made easier through my work with Lance. He guided me through the process of finding a new role that is more aligned with my talents and passion – I am much happier for it. If I could choose but one person to work with for the remainder of my professional career, it is Lance. He is an inspirational leader who brings out the best in others, no matter what their title or task. He knows how to elevate everyone around him to achieve a level of excellence that is unexpected. His knowledge of corporate culture and leadership make him a huge asset to any corporation or organization looking to move to the next level. Lance successfully helped my organization earn a place on Fortune magazine’s 100 Best Companies to Work For four years in a row. On my long and non-linear journey to become an effective human being and leader, I have derived much meaning by reading the works of important thinkers, writers, speakers and leaders. A few years ago, I had the privilege of reading, then participating in a speech, and eventually getting to know Dr. Lance Secretan. From the outset, I witnessed his phenomenal virtuosity in leading a group of 160-plus leaders from Louisville, KY as they built consensus that gave birth to their city’s collective dream. He doesn’t just eloquently teach the principles of inspiring leadership; they reside in every cell of his being. Secretan is prepared, professional and awesome. I can vouch 100% for Lance’s work — I absolutely guarantee it! He has worked with us since 1991 and has had a profound impact on…the entire company. We have never had so much positive response on a keynote speaker. Congratulations! Lance is one of the most inspirational people I have met. He helped awaken in our organization a set of principles of Leadership that had been pushed to the background by years of focusing on the wrong things. He has been a mentor to me. Just knowing him helped me move in directions I never thought possible in the business world. Often, the best wisdom is the simplest especially when it’s delivered in a clear, logical and compelling fashion. The simplicity of Lance Secretan’s Leadership Principles and his incredibly articulate, professional, and commanding presentation made this one of the very best sessions I’ve ever attended. And, that includes 40 years of Million Dollar Round Table and other industry meetings. I’ve sent autographed copies of his books to my kids and plan to send additional copies to each of my key clients. Lance, you are certainly the best presenter I have ever heard! Thank you so much for using your talents to inspire others. You have left a lasting positive impression on 200 souls in Kings County Nova Scotia and I know the momentum you started will continue for our area. I really hope we can get you back for an encore presentation! If I was to label Lance’s contribution to our success, I would label it superlative. He has a skill at making people stretch themselves. I am grateful that he exceeded my expectations and transformed us. He is a man with a mission and a message, that people need to hear. You’re one hell of a speaker! Our hearts, minds and bottom lines are deeply indebted to you. Lance Secretan is a dynamic and innovative leadership expert and his fresh ideas and rigorous challenges excited and inspired our attendees. They will use his concepts in shaping future strategies. I only wish we had been able to spend more time with him at our Leadership Institute. Of all the speakers I have been exposed to in my life, you are, without the shadow of a doubt, the one who has moved me and will change my life forever. Lance He made a positive change in our people and the way we do business. Our work with Lance was an enlightening process that has lead to remarkable results. Our senior team has matured to a high state of awareness of the needs of others and functions in a more cohesive and truthful manner. The journey mapped by Lance and his associates has been an honest, and inspiring one that is the beginning of an organizational cultural transformation that has served to awaken the entire organization to provide a higher level of service to all it touches. Lance has a highly strategic mind. When I think of the process we went through and think of Lance’s skills I am grateful for his ability to look at, process and produce in a unique and highly creative way. I personally look forward to working together with Lance and having him stretch my mind — and our business. Lance presents his material in a most unique and dynamic way that lends itself to getting people’s attention who may not have otherwise been interested, and specifically, as a result, tapping the potential of all involved. The lessons he shared, are and will continue to be, part of the reason Medtronic and each of us at Medtronic are successful in what we do. Lance Secretan will touch the souls of all! Standing ovation! I promise you! I invited him to The Netherlands and Lance was the most successful speaker we have ever had! He is simply the best! Lance was outstanding! His message is profound and utterly inspiring; his approach is powerful and so engaging. We were thrilled with every moment we had to spend with him! Lance’s presentation was rated by our members as the highest value-added component at our conference. The support we received from The Secretan Centre validated the values and principles that Lance represents and teaches – authentic living, service and leadership. Thanks for everything you’ve done to ensure the success of our event. I look forward to working with you again. Lance has had great impact on the thinking of PCC associates and clients. Our own Destiny, Character and Calling is on our website as our Covenant. He has an amazing insight on leadership and is one of the most inspiring speakers I have known. An uncommon man. Lance’s presentation to our hospital leadership and donors goes beyond words. A physician told me afterward that she was inspired to give even more to the hospital–in terms of philanthropy and time. Dr. Secretan’s message is so powerful that people are clamoring for him to come back and people who couldn’t come are calling and asking that we bring him back so they have another chance! This was more than a presentation. It was a wonderful and moving experience for everyone lucky enough to be in the room. Congratulations on yet another powerful, professional and meaningful delivery of a brilliant message. The audience left feeling inspired and equipped with a sense of purpose. Everything flowed perfectly as the pens in the room were busy noting your wise and profound information. Congratulations on having the courage to speak your heart! - Whole Pie Productions Inc. I had the privilege of attending one of Lance’s keynote speeches in the fall. His speech was unbelievably moving and inspiring. I can honestly say that he is the best speaker I have ever come across. His topics are relevant to our daily lives and the impact we can have on others. Being a good leader would interest many people in our industry. I can’t praise him enough for what he tries to instill in others. Breakthroughs! As leaders, we strive for meaningful breakthroughs that raise the level of performance and achieve something we are proud of. But things get in the way. Dr. Lance Secretan has spent his life experiencing and understanding these obstacles and has inspired countless leaders to focus on the things that really matter, that make people want to follow, and that makes leadership authentically great. Lance Secretan built a business from scratch to 72,000 full- and part-time employees, has consulted with, advised and coached leaders and their teams globally for 35 years, taught MBA students and written 21 books about leadership, inspiration and corporate culture. Along the way, he has increasingly wondered why leaders continue to adopt and invest in ineffective business practices, even though there is scant evidence that they work, and plenty of evidence that they don’t. 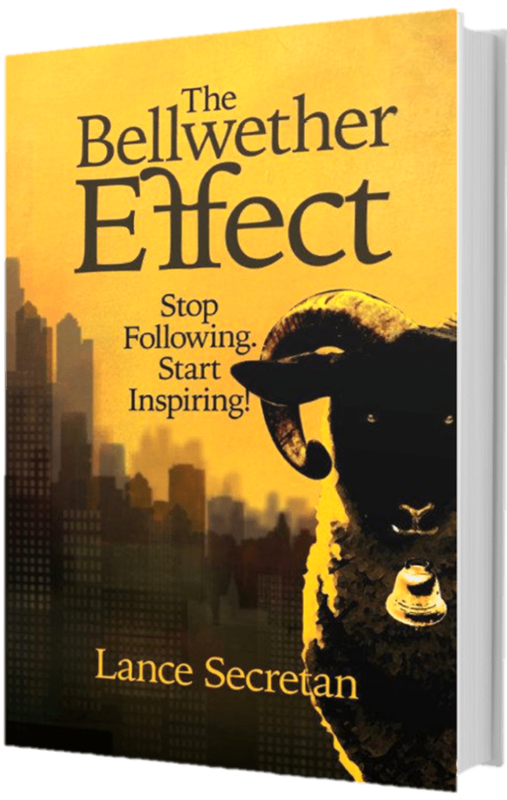 His highly anticipated new book, The Bellwether Effect, explores how and why leaders are attracted to, and seduced by, trendy ideas, and the process by which these ideas then become mainstream (he calls these originators of these trends “bellwethers”). He shares eight examples of counterproductive business practices and proposes novel and inspiring alternatives that could lead to transformation and to an impassioned culture. This is not new for Lance. He has built a reputation as a prestigious leadership coach and incredibly talented speaker. He is ranked 6th most influential executive coach globally and guides leadership teams who wish to transform their culture into the most inspirational in their industries. He has helped 6 companies to be named to Fortune’s Best Companies to Work For in America list, and 8 others are also his clients, and 30 Secretan Center clients are on Fortune’s Most Admired Companies list. He is ranked 17th in the world by Leadership Gurus, and Speakers in America ranks him among the Top Five Leadership speakers. His firm, The Secretan Center, Inc., is ranked #1 in the world as an international Leadership Consulting firm by Leadership Excellence. He is the Chairman of the Pay it Forward Foundation, former Chairman of the Advisory Committee of the Special Olympics World Winter Games and the winner of many awards, including the National Caring Award, whose previous recipients include Pope Francis, the Dalai Lama, President Jimmy Carter and Dr. Desmond Tutu. If you have never seen Lance speak, you have missed a truly memorable and moving experience. He has the ability to tap directly into why we yearn to be relevant, passionate, accomplished and embraced, and how these are the keys to a higher level of organizational leadership. He uses his unique abilities as a coach and teacher to share incredible stories and lessons that penetrate our professional armor and ignites our desire to be inspiring leaders.